Spaghetti alla Carbonara is an egg based pasta dish from Italy. Here, I share my version, which is not authentic, but also share the authentic recipe so you can choose the one you prefer. THIS PASTA IS SUPER QUICK AND SUPER EASY TO MAKE! 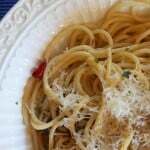 What is Spaghetti alla Carbonara? When I ask people if they’ve ever had Spaghetti alla Carbonara, and the answer is “no,” I attempt to describe it as “spaghetti with bacon and eggs” and I get the strangest looks. Well, I can imagine what they’re picturing, and maybe you’re picturing it too, but It’s not what you think, as you can see by the picture above. 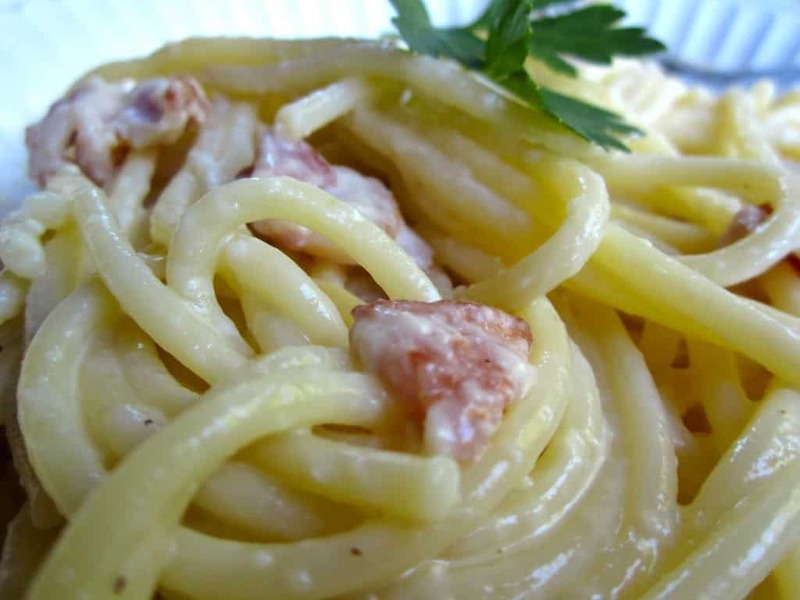 Spaghetti alla Carbonara, or “Coal Miner’s Spaghetti” is a traditional Roman meal, and one of the best known from the central Italian region. Most people tend to believe the pasta is named after the coal workers, because it was a staple for those who collected wood in the Appenine Mountains to make charcoal. There is also the theory that the quantity of bacon and powdered eggs that American soldiers had readily available during World War II was the inspiration for this pasta. I tend to go with the former idea, but the fact is that this pasta is fantastic and I’m just glad someone thought of it! 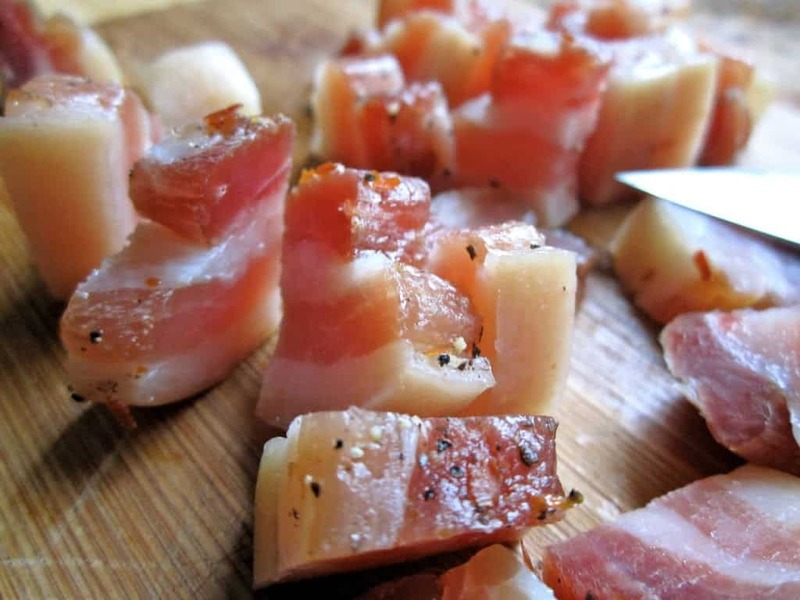 Traditionally, this dish is made with guanciale which is Italian style bacon made from pig’s cheek, however, since it’s not easily obtained in the US, I usually use pancetta (you can make your own pancetta) or American bacon and it’s still delicious. 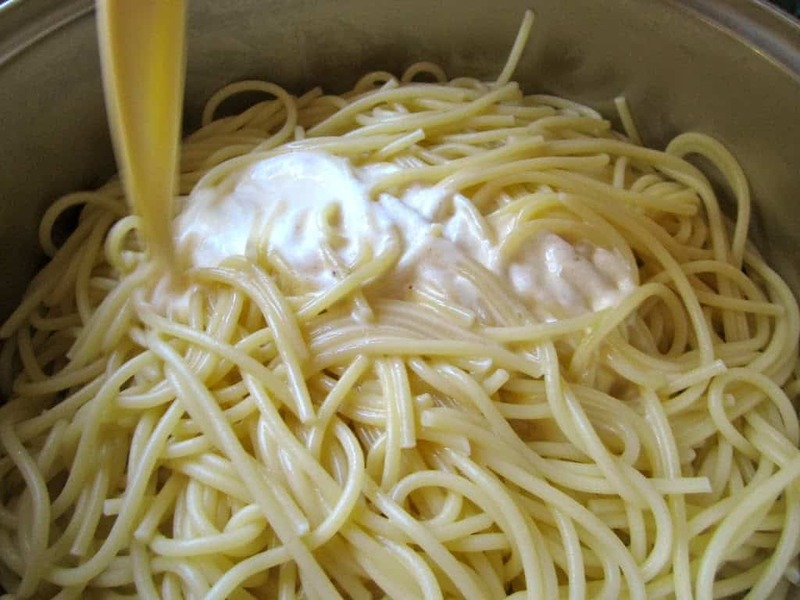 I also use cream and milk, which is definitely not authentic, but I just like a creamier, smoother and less “eggy” pasta. Years ago, I was given a cookbook as a wedding gift, called The Top One Hundred Pasta Sauces by Diane Seed. As a British born cook living in Italy (lucky duck!) she compiled 100 pasta sauce recipes in this very simple book. After reading her inauthentic version of Spaghetti alla Carbonara, I just had to try it. Well, I sort of tried it. I just couldn’t bring myself to use the quantity of the ingredients she listed!! 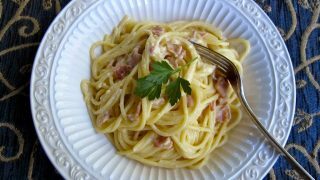 Being from Lazio (central Italy), my mother often made her version of Spaghetti alla Carbonara, but she would only use about 2 eggs and a little milk for a pound of pasta. Can you say “HEART ATTACK ON A PLATE! ?” Make sure to have a doctor nearby if you decide to make this version; you’ve been duly warned. Not to mention she lived in Rome and had the audacity to say this is Carbonara with all that cream and butter in the recipe-yikes! I’m far enough away from Rome to commit a slightly less heinous crime. I do only make it once in a while because it still is rather high in fat and cholesterol. 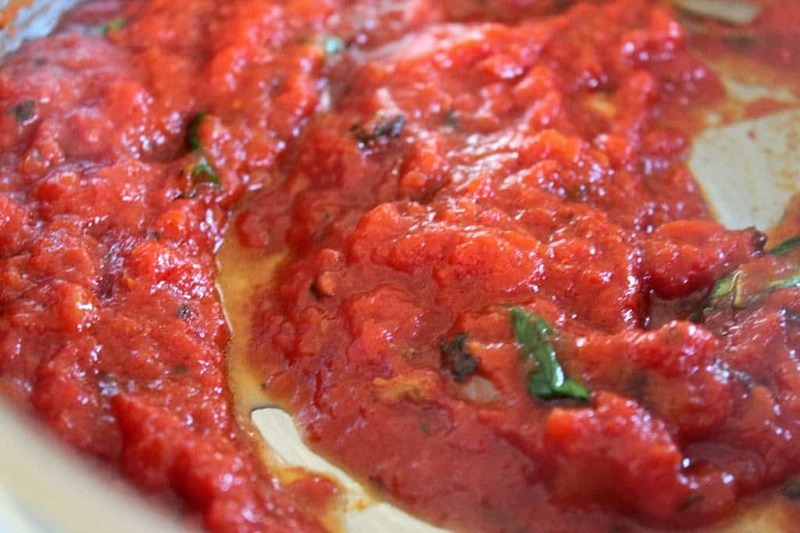 It is so creamy, delicious, and flavorful, and is also a nice change from using tomato sauce. For those of you who want to cut calories/cholesterol, I will post a lower-fat, authentic version of the ingredients immediately following the first recipe. 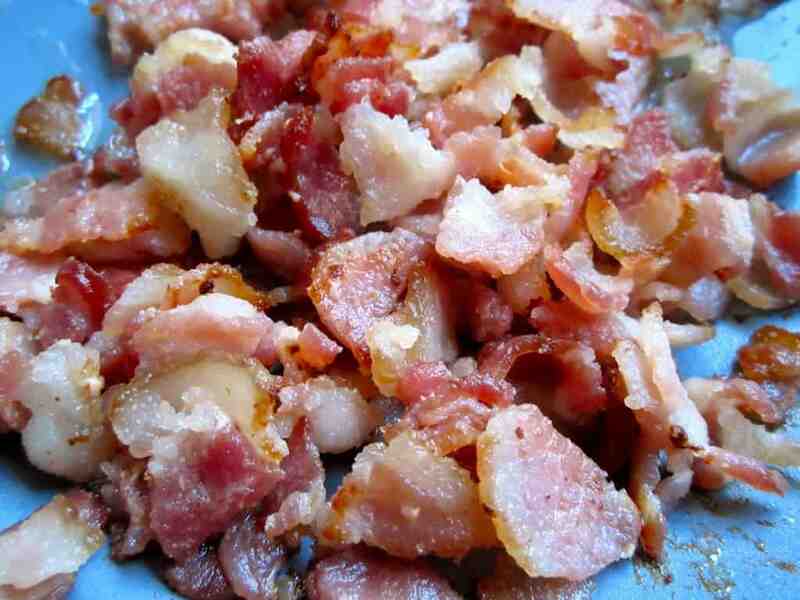 Next, fry the bacon pieces until cooked, but not crispy. It should look like this. Pasta should be in the water and starting to cook by this point. 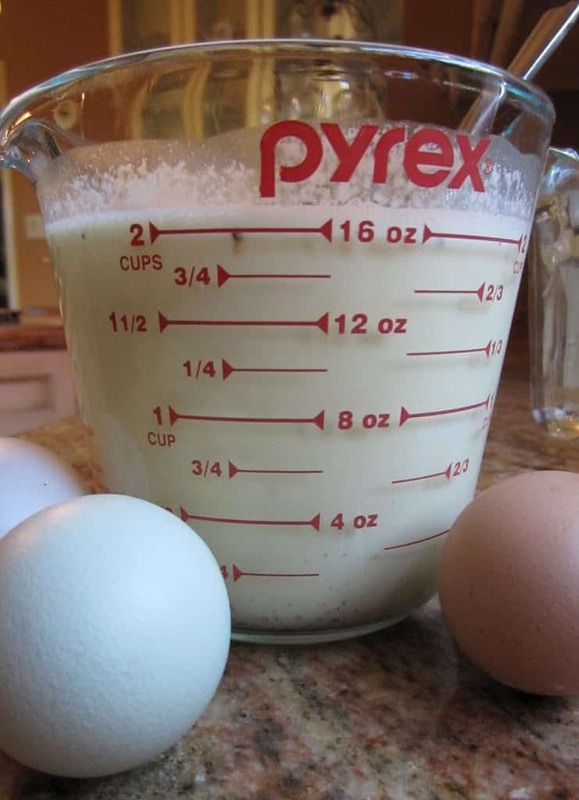 Beat the 3 eggs in a 2 cup pyrex jug. Add the cream, and fill with milk up to 16 oz. Stir well, and add some salt and quite a bit of black pepper. 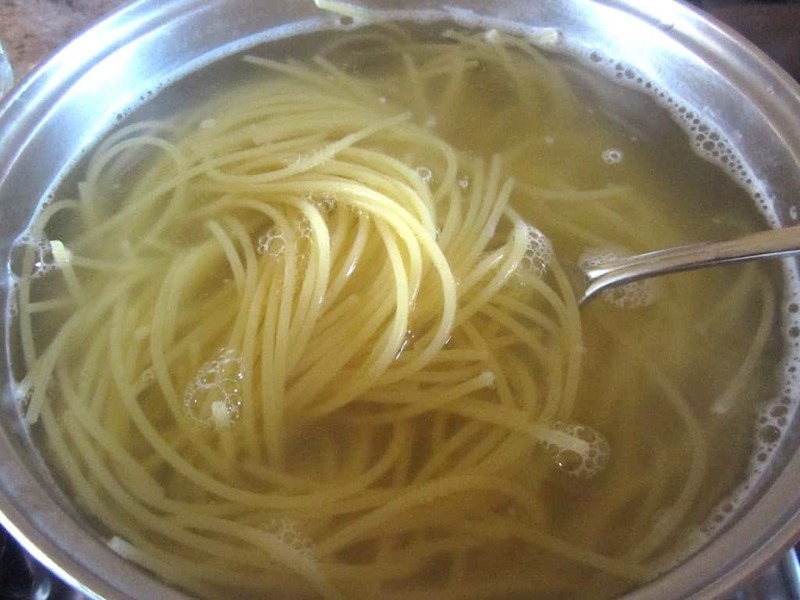 When the pasta is al dente, drain it and reserve some water, and put back in the same pot and back on the burner, over the lowest heat possible (just warm.) Now add the egg mixture from the pyrex jug. Start to stir and then add the bacon pieces. Add some of the pasta water if needed. Now add the grated cheese, and stir well to combine evenly. The eggs will cook from the heat of the pasta, so quickly turn off the burner as soon as the sauce starts to thicken. I have to admit, these aren’t photos of my own cooking. The truth is, my son made dinner tonight (yes, my 18 year old son made this). Both he and my daughter were starving, so I was rushed into dishing out the pasta for my photos. I didn’t get enough sauce mixed up from the bottom, but you can still see how creamy and delicious it looks! Everyone I’ve ever made this for has fallen in love with it! Follow directions exactly as above, omitting the milk/cream. My version of a Carbonara recipe. 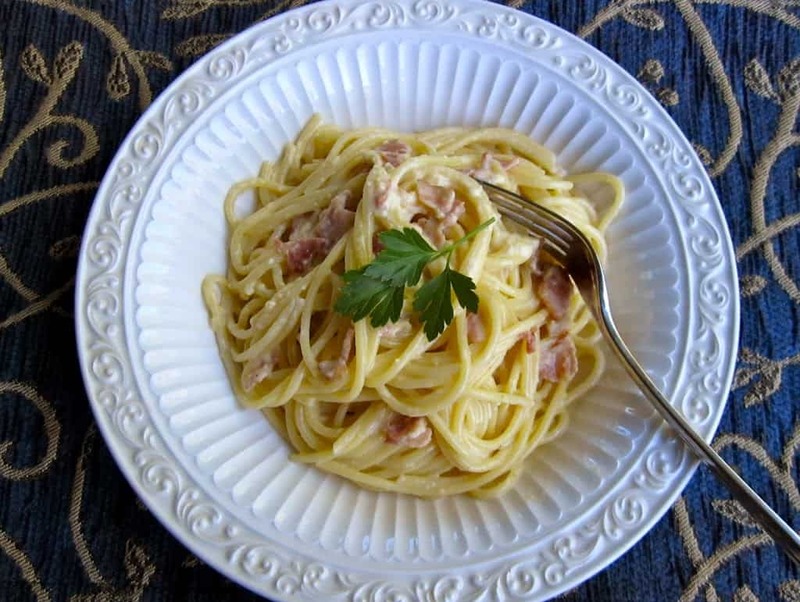 It includes milk and cream, which is taboo in Italian Carbonara recipes; it is NOT authentic. Now add the grated cheese, and stir well to combine evenly. The eggs will cook from the heat of the pasta, so quickly turn off the burner as soon as the sauce starts to thicken. That's it--it's ready! I have been cooking Diane Seed’s recipe for years. It is my go to dinner when there is very little in the fridge. There is always bacon and cream though! Nect time I will try your version. 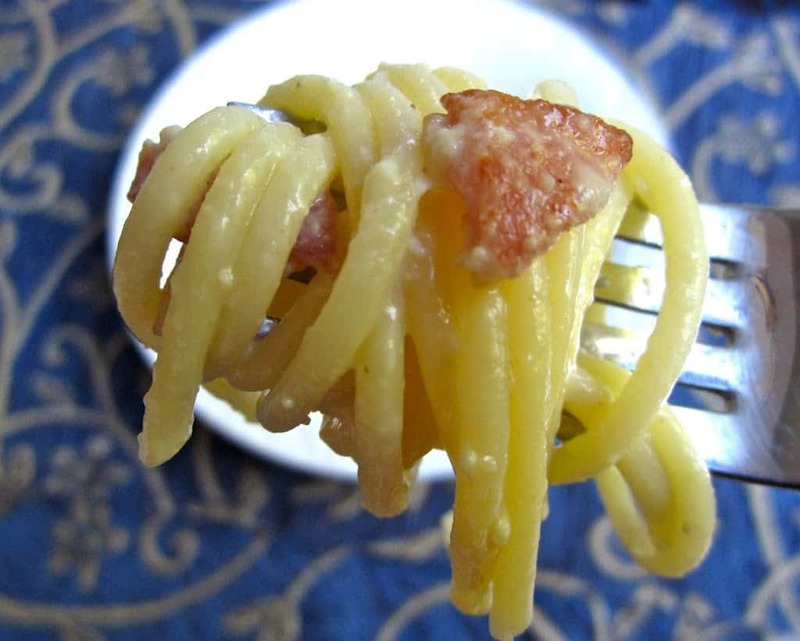 Now, it’s funny, the first post on my blog that went kind of viral—this was several years ago now, not long after I moved back from Italy—was on the authentic version of carbonara. I put it right up front: no cream! And lots of Italians chimed in to agree and say finally someone had said it (to an American audience). I may have mellowed a bit since then. Perhaps it’s having lived in the States again for so many years now, but I tend to be less doctrinaire these days. And if your Mom, who is from the region, adds milk to her carbonara, who I am to differ? I’m actually intrigued by the idea of milk (rather than cream) which is totally new to me. I’ll have to try it next time. I think it’s important to know the authentic version, which 99% of the time (to me), it’s the best! This is the 1% :) hee hee! OK, I made this for dinner the other night, and like Krista I used a version of both recipes. I was out of both bacon and pancetta :( so I used some nice ham instead. 1/2 & 1/2 and (of course) peccorino romano. Delicious. We all loved it. I made a trip to the store today, and now have pancetta as well as my fave peccorino romano – and I can’t wait to try the full-fat version. Hey, we all need a little sinfulness occasionally – right? Next thing from your recipes I want to try is the cream buns. Like you – I LOVED these when I was a child, and never thought to make them myself – but that is DEF the next thing on my list! Keep cooking Christina, and please keep posting! I love to see your posts on FB, and try to always “Like” so you know that I can see them. Thank you SO MUCH for letting me know about your ventures into Carbonara-land, Lee! Love that you made your own version and so happy you all enjoyed it! If you grew up on Cream Buns (Cream Cookies) then you’re going to be in heaven! Let me know once you make them, and thank you for liking my FB posts! It keeps FB sharing my posts with you and others, too! Love, love, love spaghetti carbonara! I don’t really follow a recipe, just throw it all in. I confess I haven’t tried using cream or half and half, but next time I definitely will. 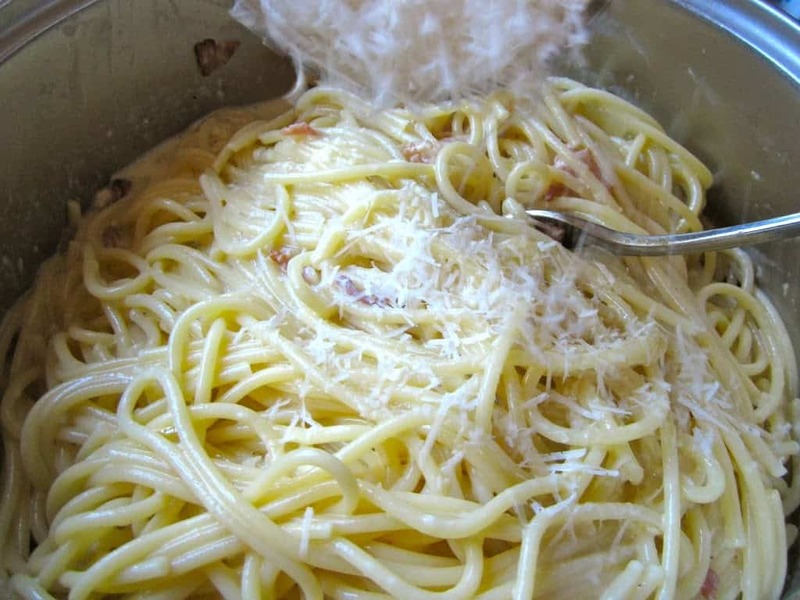 I’m usually making it for two or three people, and therefore a pound of spaghetti would be too much.I totally agree that you HAVE to use peccorino romano – nothing else tastes right. 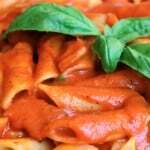 One of my favorite pasta dishes…So easy and delicious! Thanks for sharing your cooking knowledge. Made this for dinner last night (veg, without pancetta) – quick, easy, and good! Thanks! I am in love with your website. even started a special folder. BRAVO! 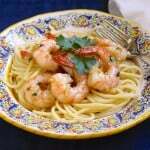 I was thinking of trying this recipe tonight using spaghetti squash. Hey Christina, I can’t believe it’s been a while since I visited – my loss! 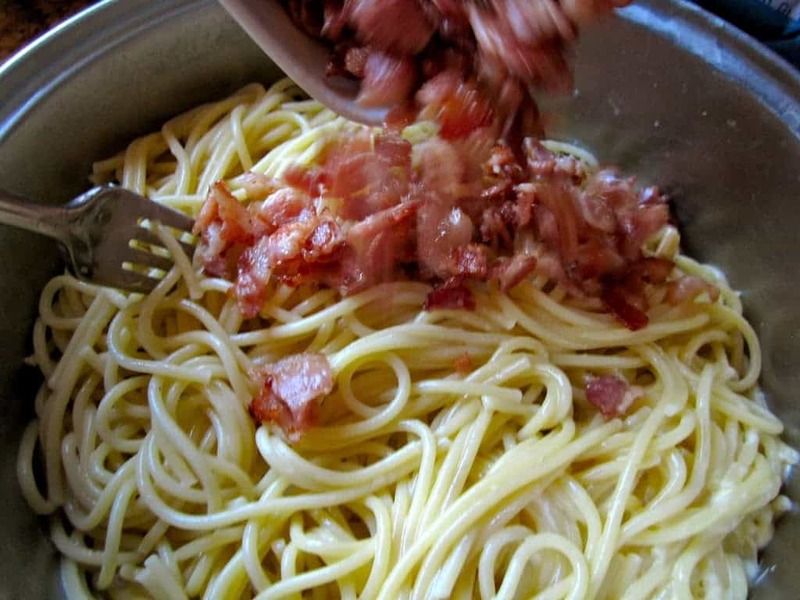 I love carbonara and both these recipes look soo good! 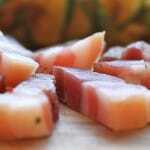 Like all great dishes, its origins are rather obscure, you’re right! Well done, your son! Hi Lin! Thanks for checking back in, yes…I too have been amiss with your blog. I see you re-designed it! Lovely! Since my son has been off to uni for a year, he has a new found desire to learn to cook more so he doesn’t have to rely on cafeteria food all the time! Bad food is a great incentive for learning to cook!! Good plan! Let us know your final answer, Medeja! Buon Appetito! A good plate of spaghetti carbonara is such a great meal! I love the real version… my thighs, not so much!